A Few Acres of Snow is a deck-building war game for two players, designed by Martin Wallace (Discworld: Ankh-Morpork; London; Brass ). 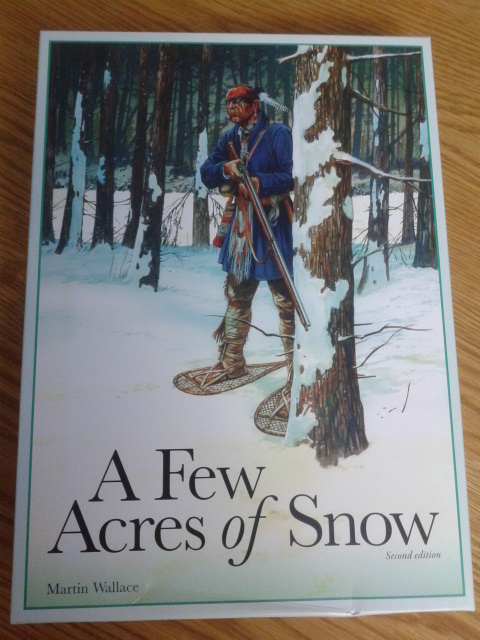 It is set in North America in the 1700s where the French are doing battle with the British for control. There are two ways to win: take your opponent’s capital by force, or amass more victory points through controlling key towns and villages. Players start with a small deck, but can draft additional canoes for river transport, ships for naval battles, and trained soldiers from home. Native Americans can also be recruited and sent to raid the enemies settlements. But as your deck gets bigger it gets more difficult to get the right cards at the right time, and your empire can seize up under the weight of trying to coordinate a diverse and spread out force. The mechanics are simple, but the choices vast, and the game captures the feeling of trying to manage what at first is a small and nimble colony, but can quickly become a bloated bureaucracy. I took charge of the British armies, but decided initially to take the more peaceful approach of building a strong economy and settling in the East. Taking Detroit was my goal, but there was a long slog of canoeing down difficult-to-navigate rivers and traversing lonely trails to get there. Meanwhile, the French raised funds by trading furs, strengthened their forces and also went west, across the a Great Lakes. 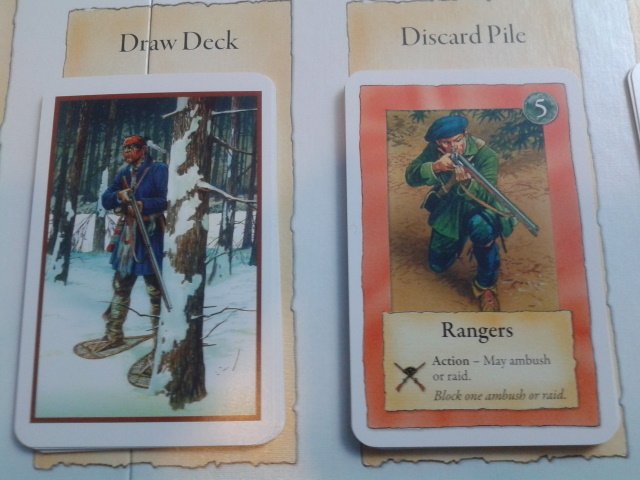 My Rangers earned their keep with daring raids into French territory, bringing back trophies. However, the French consolidated their position on the coast, fortifying Halifax and threatening the British settlements round the coast. With support from home, I had nearly captured enough territory to declare a victory, when the French launched an assault on Pemaquid. With weak defenses and my resources committed inland, it was only a matter of time before the town fell, leaving Boston open to attack. An attempt to split the French forces by seiging Detroit only resulted in further British casualties. 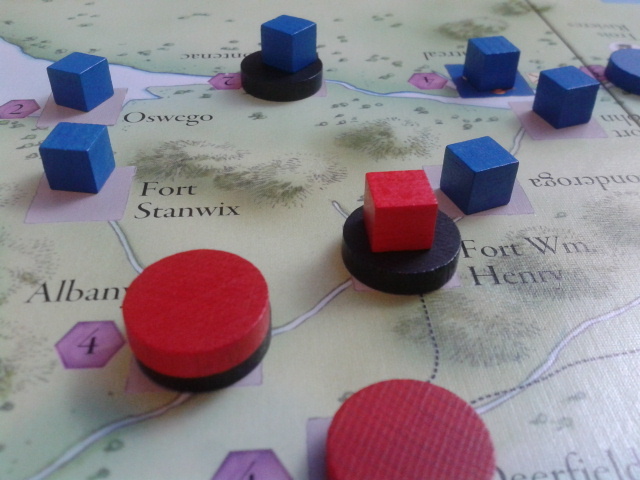 Despite the territory gained in the west, it wasn’t enough to avert a narrow French victory. The combination of card-drafting and war game seems a little strange at first, but it works very well. There are lots of difficult decisions to be made, and tricky trade-offs between short-term gains and longer term strategy, making it great fun to play. The British will be back!